Captain Mannering met us in the Windmill at Founders Park, he handed us gas masks in boxes and told us to keep them with us at all times. We needed the masks in case the Germans dropped bombs on us! We needed to keep a watch out for spies, as they might be anywhere. We saw them lurking around the buildings and on the corners. We could identify them by their big coats, scarves and hats pulled down over their eyes. There were soldiers in the streets with real rifles and they were patrolling and marching. Some of the soldiers were in camouflage gear. A London Bobby was strolling along asking us and other people for their identification. He had a whistle and a wooden truncheon in his belt. There were lots of nurses in big white uniforms. They all had red blood all over their aprons. We all saw their red crosses on their veils. At the Butcher Shop we met Corporal Jones, he was having an argument with some ladies. They said it was unfair that he saved the good meat for Captain Meandering’s wife and they only got to buy the gristly and fatty meat. They shouted and waved their umbrellas at him. We were invited into a hall for a taste of food that people in London had to eat. The ladies serving the food told us how there was food shortages in England, so people had to just have small amounts of meat and butter and eggs. Suddenly the air raid sirens went off…. we had been warned what to do! The noise was very loud and the sirens wailed and screamed. 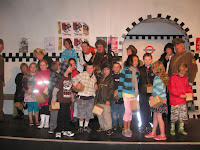 Quickly we all followed Captain Mannering and Corporal Jones to the Bunker. We had a walk along the verandahs and out across the road to a tunnel and then up steps and down into the dark. The air raid shelter was in a train tunnel, called The Underground. Many people were there already and it was very dark. We could see the railway tracks and it was cold and damp. This was very scary, because we could hear the bombs falling and then exploding. We heard the screaming noise of bombs flying across the sky. 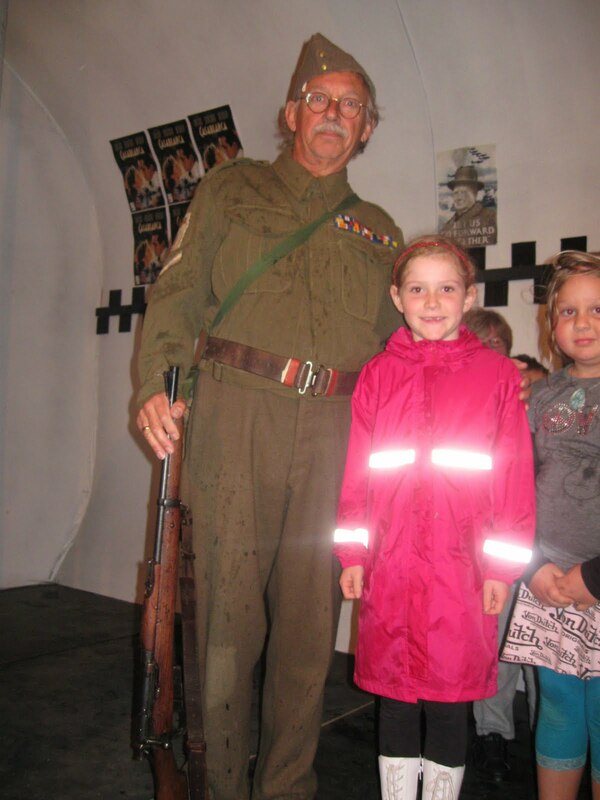 Captain Mannering told us that people played cards, had a sleep or just sat and waited for the bombs to stop. There was a lady asleep on the floor and little kids holding onto their mum’s hands. Finally the All Clear siren went and we were able get ready to leave. We crept over to the edge of the forest and saw some secret agents working in a hut. They were listening to secret messages and sending top secret codes to the army. They had French accents and long scarves. As we left the Tube station we got to talk to a Chelsea Pensioner. We learnt that he was an old soldier and now he lives in a special retirement hospital and has a special uniform to wear on special days. He had medals and a red coat. 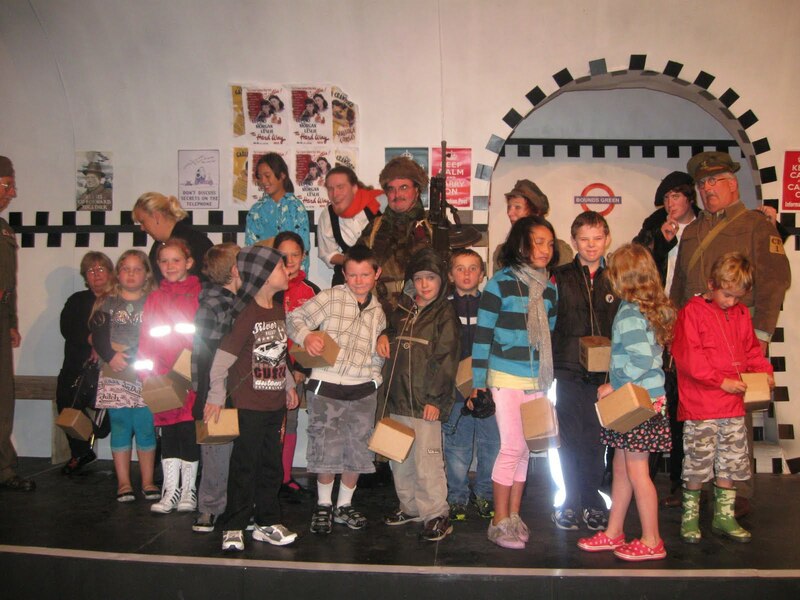 It was only a Re-enactment but it was how it was for many families and kids in London during World War 2. Some kids got sent to Wales [ where Jasmyn comes from] without their mothers and fathers. 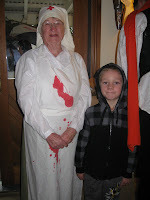 We all thought it was a great visit and we were all actors in the re-enactment.